T he Women’s Land Army was a civilian organisation set up during World War One and used again in World War Two until 1950. Women replaced men on the land, working in multiple roles in agriculture, forage (haymaking for food for horses) or timber cutting. What can we learn about the representation of women’s wartime work from The Landswoman journal? The Women’s Land Army published ‘The Landswoman’, a journal both for the Women’s Land Army and Women’s Institute in 1918 until 1920. The journal aimed at supporting Land Girls and Women’s Institute members from across the country, and published a range of articles, from advice on harvesting and tractor driving, to write-ups and photos from the latest recruitment parades. Poetry became a regular feature, such as Doris A Helsby’s patriotic piece ‘Why I Joined The Land Army’. (1) It is also clear that readers needed a good education and high level of literacy to plough through the lengthy articles in each issue (pardon the pun!). Historians do not know how many Land Girls and Women’s Institute members subscribed to the journal. However, sales records indicate that in April 1918, 40,000 copies were sold. (2) As there were around 23,000 Land Girls in World War One, we are looking at a significant readership beyond the Women’s Land Army itself. So, what can we learn by studying this popular journal? The journal worked to maintain morale for those women who were, in most cases, significantly outside of their comfort zone, as they were required to drive tractors or milk cows for the first time. Cartoons in ‘The Landswoman’ often highlighted the jovial aspects of working on the land and were less critical than those cartoons that appeared in journals such as the satirical ‘Punch’. Nonetheless, it is important to question further the ulterior purpose of ‘The Landswoman’ writers. What impression did they give of the work women were undertaking? What did the journal say about gendered expectations of women now they were carrying out conventionally male roles? The layout of the journal can prompt further questions. 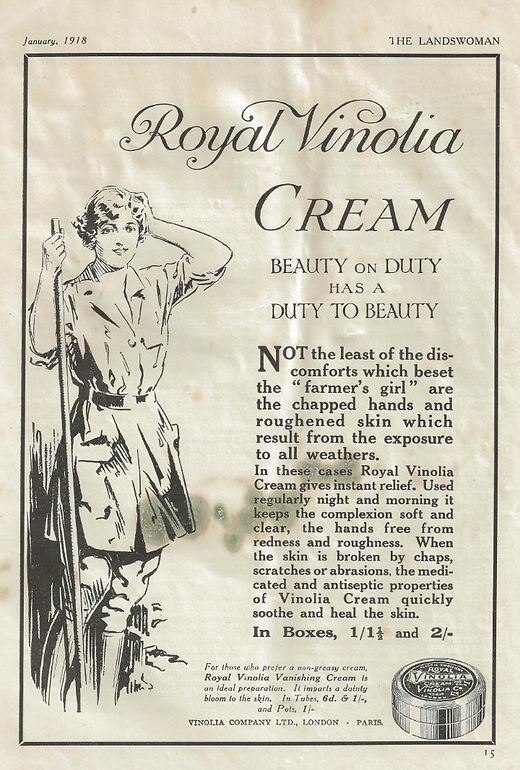 Articles on the meetings of land workers became interwoven with advertisements for hand cream under the slogan of ‘beauty on duty has a duty to beauty’, encouraging women to keep soft hands despite the dirty, hard work they were carrying out. (3) As readers today, how do we reconcile these two very different images of women? Were these images applicable mainly to middle-class readers, or did they resonate with, or raise the aspirations of, those working-class women who might have also read the journal? Did presentations of womanhood change over the entirety of the journal? These questions open up the potential for further research into ‘The Landswoman’ journal and a growing number of issues are shared online through my own website. My aim is to make as many issues available as possible, along with other Women’s Land Army documents from both World War One and Two, prompting further research into the organisation in a digital environment. Whether people are using the journal articles as bedtime reading, or analysing them more thoroughly as part of their research, ‘The Landswoman’ allows us as twenty-first century readers to glimpse the life of Land Girls in World War One and question the representation of their work in the popular media of the time. Cherish is studying History at Lucy Cavendish College, Cambridge. Cherish founded and runs http://www.womenslandarmy.co.uk, a website on the British Women’s Land Army during World War One and Two. She is also Content Director for the blog History to the Public. 1. Doris A Helsby, ‘Why I Joined The Land Army’, The Landswoman, July 1918, 152. 2. Clarke, Gill. The Women’s Land Army: A Portrait. Sansom & Company Ltd, 2008, 49. 3. ‘Royal Vinolia Cream’. 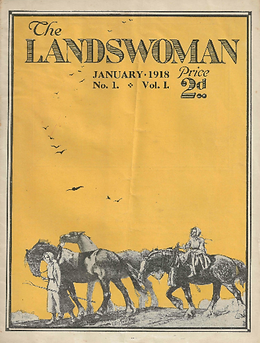 The Landswoman, January 1918, 15.